KARE 11 Investigates: Are distracted drivers getting off easy? Victim families ask why Minnesota authorities are failing to check cell phones after fatal accidents. HARRIS, Minn. – Nearly one year after a Chisago County man was killed at an intersection by a driver who ran a stop sign, his wife doesn’t have the answers she wants. Investigators were never able to determine whether the other driver was using her phone when she ran the stop sign because they waited 16 days before checking it. The victim’s widow says it’s evidence that laws need to change. A Chisago County sheriff’s deputy rushed to the scene of a serious crash on Dec. 10, 2017. When he arrived, he found a man trapped in a red Buick in the ditch. A witness told deputies the woman driving a white Kia ran a stop sign, broadsiding the Buick. Rescue workers were able free him. 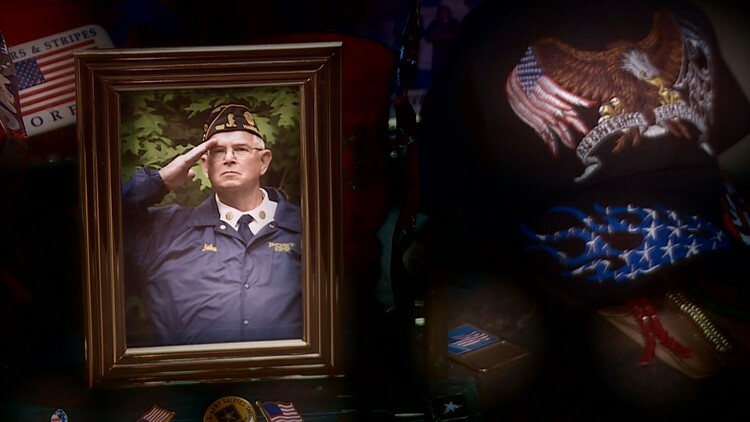 But 75-year-old John Ploetz, a Vietnam veteran and Commander of his local American Legion post, died at the hospital. Seventy-five-year-old John Ploetz, a Vietnam veteran and Commander of his local American Legion post, died after his Buick was involved in a crash Dec. 10, 2017. “It’s just devastating. He was my love, my rock, my everything,” said Joanne Ploetz, John’s widow. Now, Ploetz wants her husband’s death to force changes in the way Minnesota investigates serious crashes like this. “Come to find out, they didn’t collect any evidence. Didn’t even look at her phone,” Ploetz said. In an interview with a deputy the day after the crash, Heidi Butau, the other driver, insisted she wasn’t using her phone. She claimed it has “never been an issue,” but court records show otherwise. Butau had been cited for texting while driving twice – once in 2010 and again in 2017. “The most recent being less than a month before she killed John,” Ploetz said. Even though she had a record and even though it was a fatal crash, accident investigation reports obtained by KARE 11 show authorities waited more than two weeks before they inspected her phone. “With the lack of evidence, the only thing they could charge her with is going through a stop sign,” Ploetz said. Just a stop sign violation. And it’s not the only time it’s happened. Earlier this month, KARE 11 Investigates reported how authorities failed to check the cell phone in the crash that killed 11-year-old Brooklyn Larson. “If you’re not going to check it for this type of situation, when would you check it?” Brooklyn’s father Patrick Larson said. Now, another grieving family is calling for new rules to make checking cell phones in serious crashes automatic. “This is going to continue to happen until some legislation occurs. There’s going to be more people killed,” Ploetz said. Butau was sentenced to 10 days in jail, a $135 fine, and a year on probation for running the stop sign. She did not return calls asking for comment. Chisago County Sheriff Brandon Thyen says his department has undergone training to help identify probable cause in cases where a search warrant for a cell phone is appropriate. Captain Andrew Mahowald from the Chisago County Sheriff's Office said the primary deputy investigating the crash was not aware of Butau's texting while driving tickets. "I believe that the deputies involved did not believe that this crash investigation would end in a fatality because of Mr. Ploetz’s consciousness and ability to converse with them at the collision site. However, I do not believe it is fair to say that this incident was not treated or investigated as a criminal matter. Deputies responded, provided life saving measures along with the other agencies that responded, interviews with all parties involved including witnesses were conducted, search warrants were drafted to collect further applicable evidence and criminal charges were filed as a result of this collision, but not criminal vehicular homicide charges," Mahowald wrote in a statement to KARE 11 News.